"Falstaff Magazin" has rated the wine "La Reserve de Leoville Barton, Saint-Julien, France" from the vintage 2014 on 01.01.1970 with 92 of 100 points. "Gault & Millau" has rated the wine "La Reserve de Leoville Barton, Saint-Julien, France" from the vintage 2012 on 01.01.1970 with 14 of 20 points. "Falstaff Magazin" has rated the wine "La Reserve de Leoville Barton, Saint-Julien, France" from the vintage 2012 on 01.01.1970 with 86 of 100 points. "Falstaff Magazin" has rated the wine "La Reserve de Leoville Barton, Saint-Julien, France" from the vintage 2011 on 01.01.1970 with 86 of 100 points. "Gault & Millau" has rated the wine "La Reserve de Leoville Barton, Saint-Julien, France" from the vintage 2010 on 01.01.1970 with 16 of 20 points. "Falstaff Magazin" has rated the wine "La Reserve de Leoville Barton, Saint-Julien, France" from the vintage 2010 on 01.01.1970 with 90 of 100 points. "La Revue du Vin de France" has rated the wine "La Reserve de Leoville Barton, Saint-Julien, France" from the vintage 2008 on 01.01.1970 with 15 of 20 points. "La Revue du Vin de France" has rated the wine "La Reserve de Leoville Barton, Saint-Julien, France" from the vintage 2007 on 01.01.1970 with 15 of 20 points. "Gault & Millau" has rated the wine "La Reserve de Leoville Barton, Saint-Julien, France" from the vintage 2009 on 01.01.1970 with 16 of 20 points. "Gault & Millau" has rated the wine "La Reserve de Leoville Barton, Saint-Julien, France" from the vintage 2008 on 01.01.1970 with 15 of 20 points. "Jean-Marc Quarin" has rated the wine "La Reserve de Leoville Barton, Saint-Julien, France" from the vintage 2005 on 01.01.1970 with 84 of 100 points. "Wine Spectator" has rated the wine "La Reserve de Leoville Barton, Saint-Julien, France" from the vintage 2005 on 01.01.1970 with 90 of 100 points. "Jean-Marc Quarin" has rated the wine "La Reserve de Leoville Barton, Saint-Julien, France" from the vintage 2006 on 01.01.1970 with 83 of 100 points. "Jean-Marc Quarin" has rated the wine "La Reserve de Leoville Barton, Saint-Julien, France" from the vintage 2004 on 01.01.1970 with 85 of 100 points. "Jean-Marc Quarin" has rated the wine "La Reserve de Leoville Barton, Saint-Julien, France" from the vintage 2000 on 01.01.1970 with 87 of 100 points. "Jean-Marc Quarin" has rated the wine "La Reserve de Leoville Barton, Saint-Julien, France" from the vintage 2001 on 01.01.1970 with 86 of 100 points. "La Revue du Vin de France" has rated the wine "La Reserve de Leoville Barton, Saint-Julien, France" from the vintage 1997 on 01.01.1970 with 16 of 20 points. "Wine Spectator" has rated the wine "La Reserve de Leoville Barton, Saint-Julien, France" from the vintage 1996 on 01.01.1970 with 81 of 100 points. "Wine Spectator" has rated the wine "La Reserve de Leoville Barton, Saint-Julien, France" from the vintage 1995 on 01.01.1970 with 87 of 100 points. 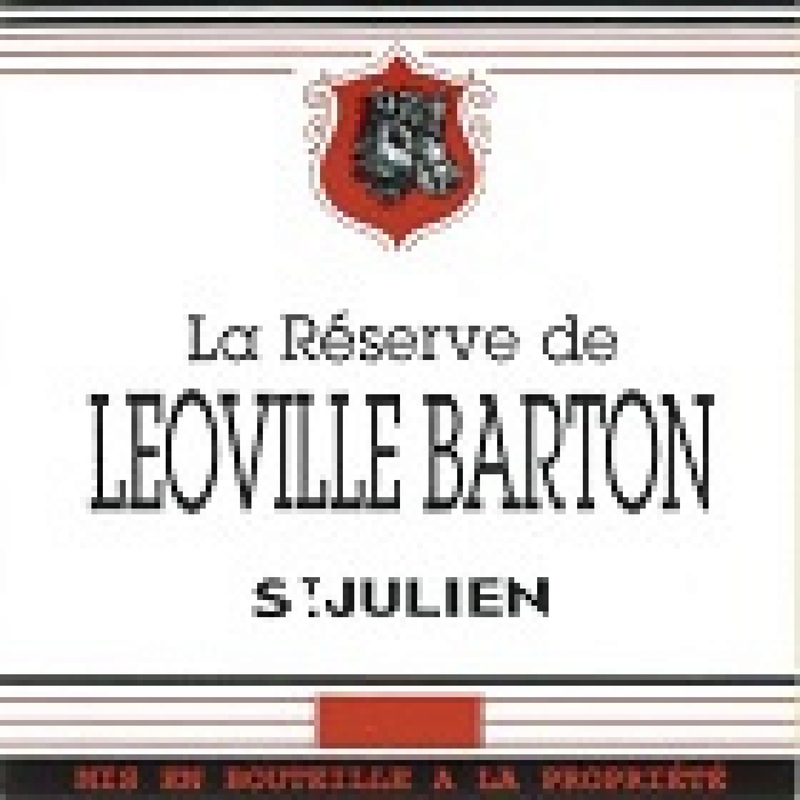 "CellarTracker" has rated the wine "La Reserve de Leoville Barton, Saint-Julien, France" from the vintage 1996 with 90 of 100 points. "CellarTracker" has rated the wine "La Reserve de Leoville Barton, Saint-Julien, France" from the vintage 2009 with 90 of 100 points. "CellarTracker" has rated the wine "La Reserve de Leoville Barton, Saint-Julien, France" from the vintage 2012 with 90 of 100 points. "CellarTracker" has rated the wine "La Reserve de Leoville Barton, Saint-Julien, France" from the vintage 2010 with 90 of 100 points.